Lane Matheson, a teacher at Memorial High School and Engineering Academy in Tulsa Public Schools, recently received a special award for her excellence in teaching at an international robotics competition in St. Louis. Matheson earned the Woodie Flowers Award at the FIRST World Championship, the crowning event for an organization that hosts thousands of robotics and engineering competitions all over the globe. The honor is presented annually to one mentor of a team in the competition who uses excellent communications skills to “inspire and empower” about engineering and design. For Matheson — who teaches Engineering Robotics, AP Calculus, AP Physics and Electronic Robots in addition to mentoring the FIRST team — the award had been a long-term goal. Still, she was surprised when she won it. “I thought it was going to take me quite a bit longer to do more for FIRST,” she said. When she stepped away from a decade-long career in the space industry, Matheson thought she would just try teaching for five years. In 1995 she accepted a job at Memorial, started teaching engineering in 1997 and by 2000 was introducing kids to robotics. She even met her husband, who was then chairing the science department, at Memorial. Robotics has provided a gateway to get students interested in STEM fields, Matheson said. Although the most well-known aspects of the FIRST program are its competitions, the students who participate gain an array of unexpected skills. Before any robots are built, Matheson’s students produce videos and practice animation and 3D modeling. They learn to speak and write professionally. Often she has them work on handwritten letters, a skill that’s becoming less and less instinctual. Those skills came in handy when the kids submitted essays nominating Matheson for the Woodie Flowers Award. 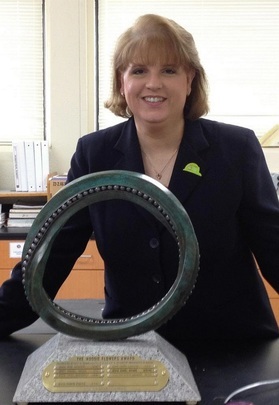 The award attests not only to the quality of the mentor, but also to her advocacy of STEM education. Matheson said she does a lot of outreach in TPS to get younger kids excited about STEM and Memorial’s engineering program. In 2010, she helped host an inaugural FIRST Lego League Tournament at her school, a contest aimed at drawing kids between 9- and 14-years-old; the competition recently had its biggest attendance ever. Memorial also hosts two summer camps every year — one just for girls entering sixth through eighth grade, and another for all kids interested in engineering. More than 12,000 students competed in the FIRST Championship, where Matheson won the award. She was selected for the honor by her own students, other teachers and FIRST mentors. Keeping with her mission of spreading a love for engineering, Matheson is especially enthusiastic about the future. Seven chess matches for each student, limited to two hours apiece, over a three-day period. That’s what stood between 25 kids from Edmond’s Ida Freeman Elementary and a championship trophy that was taller than some of the competitors at the U.S. Chess Federation National Elementary Championship in Dallas last weekend. In the end, the 25-member Edmond team was named the national champion in its division. After 17 years of competing — and three second-place finishes along the way — the Ida Freeman Elementary chess team had finally claimed the top spot. “I broke down completely when the numbers came in. It’s a big deal,” said chess coach David Nichols. It was an eventful trip in other ways too. Dallas emergency management officials issued a tornado warning while the kids were checking into their hotel. On another night, someone from another school pulled the hotel fire alarm and guests had to evacuate. And the chess team’s bus broke down after dinner Saturday, nearly forcing some of the kids to miss their matches. It was in the seventh and final round when the Edmond team, comprised of fourth- and fifth-grade students, earned their highest cumulative score and clinched the title in what had been a close race. Ida Freeman’s team won by 3.5 points, or a couple touchdowns in football terms, Nichols said. “There were three schools, in particular, from the New York City area that we could not shake all tournament long,” he said. Nichols, who also teaches fifth grade, said this year there are about 85 regular members of the Ida Freeman chess club who stay a few hours late every Thursday. They play eight state tournaments throughout the year. Chess teaches students to visualize, plan and focus. Chess matches are sometimes the only time that children who have trouble focusing in class will sit still for three and a half hours, never breaking from the game. It also teaches civility and sportsmanship, Nichols pointed out. “That’s the first lesson on the first day of chess camp,” he said. Chess camp meets on Saturdays in August. All third-, fourth- and fifth-graders at the school are welcome, and some second-graders also attend by invitation. “After 17 years it’s become part of the culture of our school. It’s kind of our football,” Nichols said. There weren’t any elementary schools in the area with a chess program when he decided to start one at Ida Freeman. 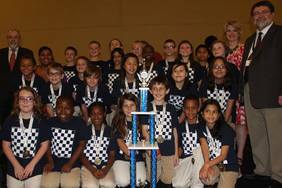 But chess has steadily grown in popularity and is now in several Oklahoma schools. Now with a championship trophy in their case, the Ida Freeman team shows no sign of slowing down. They’re already setting their sights on next year’s national championship, and Nichols is confident they can pull off another win. The biggest lesson for the kids, according to Nichols, is that hard work leads to rewards. “They’ll never know how proud I am of them,” he said. REAC3H Regionals are day-long conferences that offer professional development and give educators access to resources and information to help them continue improving student academic achievement. More dates and locations will be announced as they become available. Look for more detailed descriptions and a registration link soon! The Oklahoma State Department of Education, in partnership with the University of Central Oklahoma, is still seeking input from educators on professional development content and formats that support teachers in their work with students. We invite you to take a 10-minute survey that will help OSDE develop and refine professional development opportunities available to all educators. Every educator has valuable input to professional development, and we want to hear from as many as possible. Many of you have already participated in the survey, but to get as much input as possible it will remain active for a few more days. Please take a few minutes to share your thoughts. When: June 9 – 11 and July 28 – 30 for OKMath and ELAOK; June 9 – 11 for Elementary OKSci and July 28 – 30 for Secondary OKSci. How: Click here to apply. Reimbursement: Teachers living more than 65 miles from the event will be reimbursed for their travel and the Oklahoma State Department of Education will pay for hotel rooms. Lunch will be provided for all attendees. The competitive grant process for the 21st Century Community Learning Centers (CCLC) program is now open for the 2014-2015 school year. 21st CCLC programs provide safe and engaging learning opportunities for students during out-of-school hours. The programs offer academic enrichment through hands-on, project-based learning in subjects like STEM education, tutoring, health and fitness, mentoring, character education and service learning. Eligible grant applicants must propose to serve students who attend a school that is eligible for designation as a Title I school-wide program. Either Local Education Agencies or non-district organizations may apply, although the process is slightly different for each group. In both instances, the applicant must demonstrate a partnership between an organization and a district. Letters of intent to apply are due at 3 p.m., Thurs., May 29. Completed applications are due June 24. The entire process can be completed online. May 19, 2 – 3 p.m.
May 28, 2 – 3 p.m.
June 4, 2 – 3 p.m.
June 11, 2 – 3 p.m.
June 18, 2 – 3 p.m.
June 25, 2 – 3 p.m.
July 1, 10 – 11 a.m.
May 20, 10 – 11 a.m.
May 27, 2 – 3 p.m.
June 3, 2 – 3 p.m.
May 19, 10 – 11 a.m.
June 2, 2 – 3 p.m.
June 9, 2 – 3 p.m.
June 5, 3 – 4 p.m.
June 12 3 – 4 p.m.
June 19, 2 – 3 p.m.
June 26, 3 – 4 p.m.
July 1, 2 – 3 p.m.
June 19, 3 – 4 p.m.
June 26, 2 – 3 p.m.
July 1, 3 – 4 p.m.
July 10, 2 – 3 p.m..